The Stock at the Docks event is over for another year, and what a great success. 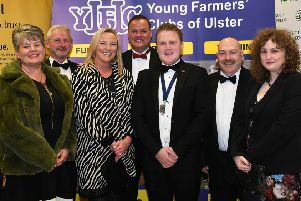 Recently, 350 people came together at Lisahally Market, Londonderry, on Friday, June 29th to take part in the City of Derry YFC Stock at the Docks event. The aim of the event, was to provide an evening where the entire community, but particularly those from the local rural area could come together and celebrate the rural way of life. As a result, the main attraction was a stock judging event where those present had an opportunity to judge sheep, beef and dairy cattle on the basis of their production potential. Thanks goes to David Devine, Gordon Crockett and Robert and Steen Lowry for bringing along their livestock for the public and community to judge. Well done to the stockjudging winners; Overall over 18 - Sharon Kee and Under 18 - Jack Killen. A number of trade stands were also in attendance: Drumahoe Veterinary Clinic, Eakin Bros Ltd, NFU Mutual, Fane Valley Stores, D and M Farm Services, Allen Connell Machinery and Lawrence Deehan from LCD Driving Academy. City of Derry YFC would like to thank these businesses for coming along to add to the atmosphere of the evening. The club could not recommend Kidz Farm and Cromore Castles, Portstewart enough for their fantastic entertainment. This year the YFCU president’s theme is ‘Embrace Change’, for City of Derry YFC to embrace change they decided to raffle a wheelbarrow with a wide variety of items/products included. Congratulations go to Les Snodgrass who was the lucky winner. The event finished with an auction in aid of Foyle Hospice. The total will be announced over the next few weeks. The club would like to extend their thanks to those who provided prizes for auction and to Richard Beattie who provided the use of the premises and provided his services as an auctioneer for the evening. Thanks to all family, friends and supporters of the club who came along to make it such a success. Last but not least special thanks to the club’s hardworking and dedicated members who helped before, during and after the event as it wouldn’t have been possible without them.